This Bacon Jalapeno Popper Burger combines three of my favorite summer flavors – beefy, cheesy, and spicy. This flavor-packed burger is easy to make using just a few ingredients. One of my favorite things to eat as a kid was a cheeseburger, but that was more of a regular burger that you would get at a fast food place. This burger is a boulder version that adds heat to the flavor with a thick juicy beef patty. The intense heat flavor is matched with cheddar jack cheese that perfectly blends together. This, my friend, gives you that incredible flavor that explodes in your mouth. Let’s start with the meat. A good burger patty must have the right meat to fat ratio. For me, 80/20 meat ratio is the right blend. Of course, the meat will be bland without a perfectly seasoned patty. Simple is the way to go for me when it comes to seasoning- salt and pepper. Just the right amount of seasoning without overwhelming the flavor. The way you cook the patty is just as important. Some like to grill giving that charred flavor, but I prefer to cook in a pan. I like the crust on the outside of the patty while still keeping the inside tender and juicy. When it comes to buns, some people think it is just as important as the patty. Honestly, I’m not a big fan of big fluffy brioche buns. I prefer the regular thin hamburger buns and let the meaty burger patty be the main attraction of the dish. Lastly, the toppings. Again, simple is better. Don’t let layers after layers of toppings overwhelm the actual burger. Mayo, ketchup, and some type of cheese are good enough for me. Sometimes I like to add bacon just like this recipe. Let’s dive into the specifics on making this delicious burger. As I mentioned above, go for at least an 80/20 meat to fat ratio ground beef. If you want to step it up a notch, you can ground a mixture of brisket, chuck, and boneless short rib. For this recipe, I only used regular ground beef that you buy at a grocery store. Of course, it wouldn’t be a jalapeno burger without the jalapenos. It is up to you how much jalapeno to mix with the burger. You don’t have to use the whole jalapeno. If you want a milder burger, lessen the amount of jalapenos mixed with the meat. When cooking the burger, try cooking it on a pan instead of grilling. I find it easier to cook on a pan and keeping it moist on the inside and crispy on the outside. When grilling I tend to get flare-ups and resulting in an overcooked burger. Toasted or untoasted? I prefer the buns to be toasted. It adds a bit of crispiness to the buns. Not much toppings on this burger. 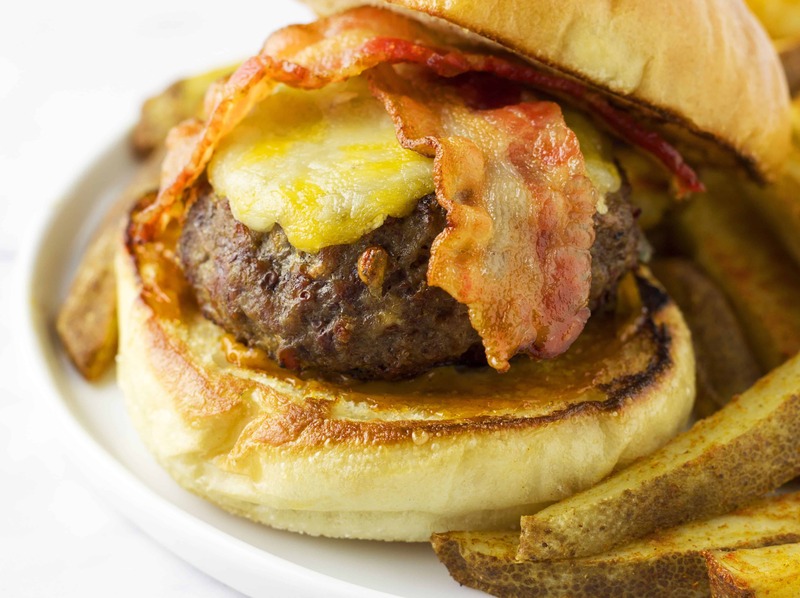 The bacon, chipotle mayonnaise and cheddar jack cheese perfectly compliments the burger. By the way, if you have extra jalapenos, you can slice them up into strips and fry them. They make great extra toppings for this burger. 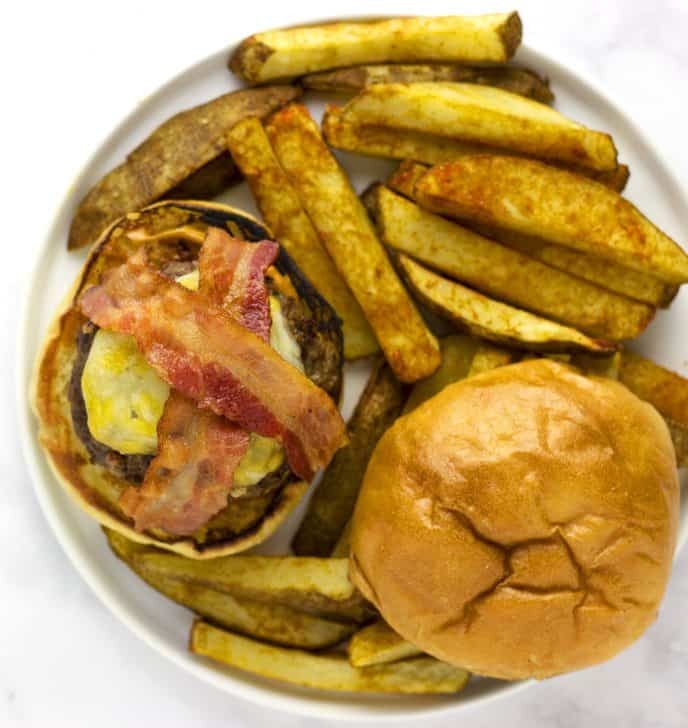 I paired this burger with baked potato fries seasoned with chile and cumin. Now take a look at that deliciousness! Delicious and hot bacon jalapeno popper burger. Mince jalapeno. Remove ribs and seeds. Set aside. Mix ground beef, minced jalapeno and 1 oz of shredded cheddar jack cheese in a bowl. Add salt and pepper to taste. Form 2 patties about 1/2 inch thick. Heat pan to medium heat and add 1 tsp olive oil. Add buns to pan and toast for 2 minutes. Set aside. Add patties to pan and cook for about 5-6 minutes until brown and crispy on the outside. Make sure the internal temperature reaches 160F. Add remaining 1 oz of shredded cheddar jack cheese on top of the patties. Cover for about 1 minute until cheese is melted. Add bacon to pan and cook until crispy. Prepare burger. Add chipotle mayonnaise on the bottom bun. 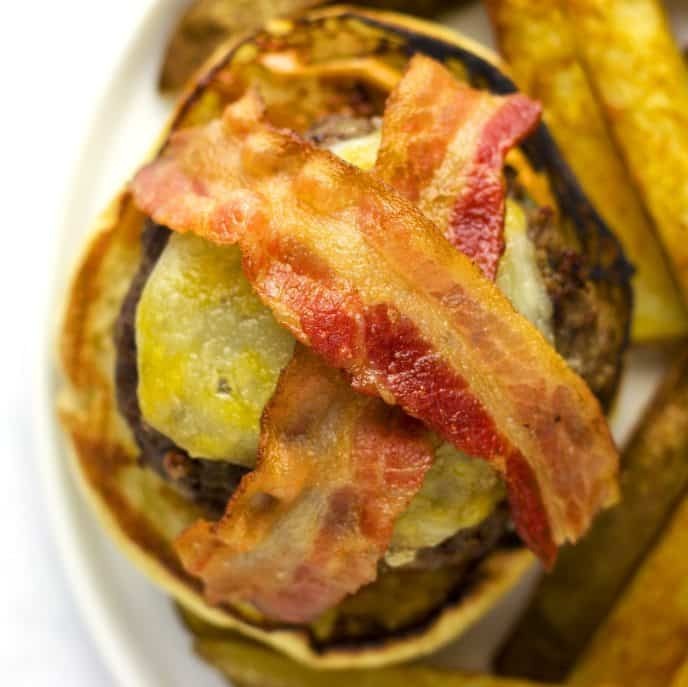 Top with burger and bacon. Sprinkle some cilantro on top.